We can provide you the ability to transport various types of products with our material handling equipment for your warehouse and loading dock facilities. Vertical Conveyors, also called VRC’s or Vertical Reciprocating Conveyors, move materials in warehouses, loading docks, factories, industrial plants, storage facilities or anywhere that products need to move from one level to another. They are not elevators and thus are exempt from restrictive elevator codes. Vertical Conveyors provide safe and efficient access to mezzanines, basements, balconies and between levels in multi-story buildings. Vertical Conveyors are custom built for your needs. A Yard Ramp can be used to load trucks from ground level when you do not have a loading dock or a truck-high loading dock. Yard ramps are easily positioned using a forklift. Adjusting the yard ramp height is easily managed using a hydraulic pump. They come in a wide range of sizes depending on your needs. A Dock to Ground Ramp extends from the ground up to your loading dock. Quick to install and secured to the dock, they normally do not require any additional construction. Dock to Ground Ramps come in a wide range of lengths, widths and weight capacities. The ability to handle the heavy lifting while providing dependability and versatility are the core needs of Utility Vehicles in and around a warehouse and loading dock facility. Whether your need is hauling materials, moving tools or chasing stock, we have the Utility Vehicle that will be the answer. 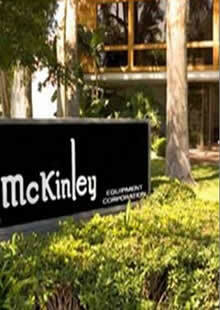 Contact the experts at McKinley Equipment to discuss your unique vertical conveyor need or other material handling need. We are a licensed and certified distributor.